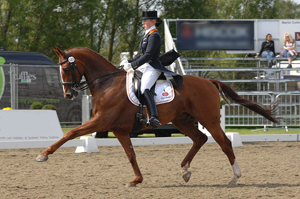 A dressage horse and rider performing the extended trot. Image: Chefsna. It's a great day for individual dressage today with the Grand Prix freestyle test taking place in Greenwich Park. It's amazing how those horses can perform elegant and complicated movements without getting their legs in a muddle. Coming to think of it, it's amazing that they can even go through their innate gaits without getting their legs in a muddle, given that there's four of them and they are very long. And what about animals who've got even more legs? It turns out that it's all down to symmetry in the brain. To find out more, read Ian Stewart's Plus article Walk, trot, gallop.